The history of South Texas is usually written beginning with the arrival of the immigrants in the early 1700's with their European culture. It is presumed by many that history begins when there is a written recording of events, significant or otherwise. However, human history begins with the advent of human beings and their activity and not necessarily with the introduction of a more complex form of communication, such as writing the representations of sounds. It is postulated by many that the Native People have been in this country for 40,000 years, others say 11,000. Native People say they have been here since they were formed by the Creator and that they are a part of the environment and that Nature is part of them. Let's go back 300 years ago when Native People were the majority in what is now Bexar County. The mix of flora and fauna of Bexar County would be markedly different than that of today. For example, bear, cougar, and wolf would be usual and common residents. Buffalo or bison would be regular visitors to the area. In the clear streams, you would find alligator, large snapping turtles and gar as well as abundant fish of many species. Many types of birds that are no longer seen here, such as macaws, existed along the river valleys. Of course, prairie chickens, now nearly extinct, were plentiful on the open spaces. The People that inhabited South Texas (Bexar County) and parts of Northeastern Mexico prior to the arrival of the Europeans are referred to by scholars as Coahuiltecans, the name being derived from the name of the northern Mexican state of Coahuila. There were up to 200 or so small bands or tribes and the common language spoken by most of the tribes or bands, is referred to as "Coahuilteco" or “Tejano” by linguists. The range of the various tribes or bands of the Coahuiltecan People was as far south as San Luis Potosi in Mexico and as far north as the Hill Country in Central Texas. The Coahuiltecans made their living mostly by being hunters and gatherers. That is, they would hunt game and seasonally consume the available plants, berries and nuts. Although these tribes have been referred to as "nomadic", that term is not totally correct. They had a pattern of using an area and moving to another when the available game or foodstuffs were depleted. There was a seasonal return to the same locations. As an example, the Malaquita Tribe would spend the winters at the Texas Coast and travel North toward the San Antonio area as the weather warmed. There is a portion of Padre Island on the Texas coast that is remembered as Malaquite Beach. On the way north about 20 miles south of San Antonio, there is a river crossing called “el paso de las Malaquitas”, or, the Malaquita ford. Much of the history of these People prior to the 1700's maybe unknown but it exists, nevertheless. These were the People that first saw (discovered) our rivers (now called San Antonio and Medina), the People that first settled the river valleys of South Texas, that first hunted deer and buffalo and even mastodon! Why did the Coahuiltecans choose these river valleys? They were drawn to the locality by the abundance of water - as were all the other creatures. The plentiful game animals and fish assured the constant population of the area by the Coahuiltecans. Also, the natural beauty of the springs and surrounding timber imbued the humans with a feeling of spirituallity and well-being. The Native People had a great reverence for the water and springs of the area. The Natives considered the springs as sacred because the water came out of Mother Earth, much like at the time of human birth when the water comes forth. Also, the water, and those animals and birds associated with water had always been a large symbolic part of their ceremonies. They called the springs "wan Pupaco". The river was known as "wan akkan"
(according to the translation of Fray Gabriel de Vergara, a missionary, at Concepcion Mission in 1732). Ceremonies celebrating the seasons, victories in war, and boys coming of age would be held with feasting, dancing and singing for three or four days. The Natives also conducted ceremonies for funerals and held other rituals in times of difficulty. The bow and arrow was the weapon used for hunting and war.....and before the bow, the atlatl, a type of spear had been used. To hunt small game such as rabbits, they used a curved wooden club which was thrown at the quarry. Nets made from the fibers of local plants such as yuccas were used for fishing. The Native People had trading networks. Goods from the coast would be traded to the inland tribes and vice-versa. Hides and skins would be traded for other goods such as bowwood, ornaments, beadwork, shells, feathers, etc. Long before the present infrastructure of governments, roads, and international communication, trade was an important part of the local economy. It is not unreasonable to believe that occasionally, goods from as far south as present day Mexico City made their way through the San Antonio River Valley on their way to points North and East. South Texas has two native plants much prized by Native Americans. One is the peyote cactus used as a medicine in religious ceremonies. The other is the red bean of the Texas Mountain Laurel or Mescal Bean (Sophora secundiflora). It is used in ceremonies and for decoration although the bean is highly toxic. It is an overlooked fact that on every early expedition of the Spanish or other Europeans into Texas, there was always a Native guiding the expedition. The expedition would not move without a guide because it was essential to be able to find the established trails and also find sufficient water and pasturage for the livestock and horses. When the Spanish first arrived in Bexar County the late 1600's and early 1700's, they found several villages (rancherias) along the rivers and headwaters. Some seemed to be permanent. Villages tended to be formed either at the headwaters, nearby, or, at a convenient crossing or ford. During a 1716 expedition, the friars noticed terraces and irrigation ditches near what is now called "The San Antonio River". The Natives apparently were engaged in agricultural activities although those activities probably were of a small scale. This contradicts what many historians have written about the Native People and this is evidence that some of the Coahuiltecans were occasional farmers at least. Father Massanet met with the Coahuiltecans of the Payaya tribe near the headwaters of the (San Antonio) river on June 13, 1691. According to the reports, he asked the Payaya the name of the stream through an interpreter from the Pacpul tribe. It was stated in the missionary diary that the Payaya responded that the name of the river was "Yanawana" (written in Spanish as "Yanaguana"). However, Father Massanet named the river "San Antonio de Padua" because June 13th was the feast day of the Catholic saint. 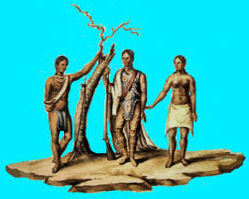 The Payayas thereafter served as guides for the expedition's northeast travel "as far as the rancherias of the "Chomanes". In the first part of the 1700's, The Spanish government and the Roman Catholic Church authorized the Franciscan missionaries to begin building missions for the Natives. Five Indian missions (that still exist today) were built in The San Antonio area in the early 1700's. They are: San Antonio de Valero (the Alamo), San Jose y San Miguel de Aguayo (San Jose), La Purisima Concepcion, San Juan Capistrano, and San Francisco de la Espada. In 1718, the mission of San Francisco Solano which had been located on the Rio Grande River below Eagle Pass was removed to San Antonio and became San Antonio de Valero, the Alamo. Similarly, three other Indian missions, Concepcion, San Juan and San Francisco de la Espada were moved from their original establishments in East Texas in the 1730's. Next, the Native People are put in possession of the missions.